Microsoft Security Essentials is the free entry level anti-virus solutions from Microsoft, which targets at Windows users who don’t want to pay for security solutions or just want to have basic peace of mind when using computer. Microsoft Security Essentials (MSE), which was codenamed Morro, had been released to limited beta for free download in mid 2009. The first official beta release of Microsoft Security Essentials (MSE) has the version of 1.0.1407.00. And Microsoft has released an updated version of MSE available, with the version number of 1.0.1500.0. The update is available through Windows Update for existing Microsoft Security Essentials users, and the standalone offline installer in Microsoft Connect. While Microsoft Security Essentials is absolutely free with no subscription or payment required, its features on online and PC security is total and complete with realtime scanning support. It provides detection, protection, scanning and removal of viruses and spyware, including Trojans, worms and other malicious software. 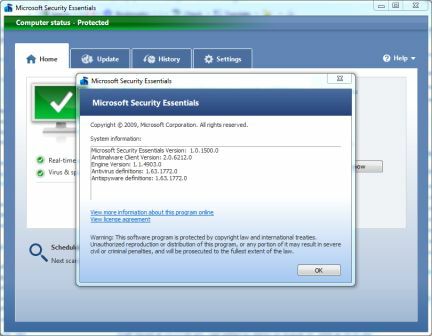 The new version of Microsoft Security Essential is still a pre-release or beta software. Before Microsoft Security Essentials 1.0.1500.0 officially went live, there is a version 1.0.1501.0 appeared on Microsoft Connect. However, the v1.0.1501.0 build of MSE may be just the typo mistake. For users who can’t accessed to Connect website, or don’t join the Microsoft Security Essentials connection, here’s the setup installers for Microsoft Security Essentials 1.0.1500.0 for Windows XP and 32-bit or 64-bit Windows Vista and Windows 7. It’s pretty strange that the first leaked copy of Microsoft Security Essentials has a higher version of 1.0.2140.0 instead.